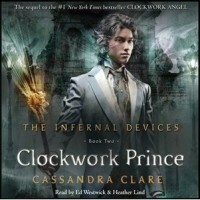 In the middle book of Cassandra Clare’s Infernal Devices trilogy, drama continues for the Shadowhunters. Charlotte may lose her seat as the head of the Institute, and Tessa, Will and Jem could soon be without a home. The team has to get to the bottom of the feud with the Magister before it’s too late. Meanwhile, Tessa can’t decide which Shadowhunter she loves the most.I recently listened to the audiobook of Clockwork Angel, and I enjoyed it, though not as much as the Mortal Instrument series. The slow pace and new characters took some time to get used to, even though I appreciated the charm of the Victorian England setting and new mysteries. Because I’m a fan of Clare’s I had to take a chance on the next installment. 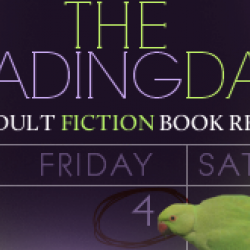 This time around I felt more comfortable with the book and it was a much easier listen. The characters got to show more personality and made me care about their fates. And, maybe even the two new audio narrators had something to do with a more successful experience this time around.Clockwork Prince introduces more new characters and mysteries. There are answers to questions introduced in the first book, some shocking reveals and revelations, and even more questions to ponder. We get to know side characters such as Charlotte, Henry and Sophie a little better and there are some lighthearted times in addition to the familiar mystery and angst. And lots more of my favorite Magnus Bane.What summarizes the book to me is the love triangle. It is one of the most torturous love triangles I’ve ever read. It seemed to me that most every scene in this book led back to the tangled love affair between Tessa, Will and Jem. This is one agonizing and angst-filled situation. And all I can say is with trilogies the middle book breaks your heart and I don’t for a minute think this triangle is over.I listened to the audiobook of Clockwork Prince to enhance the Victorian London flavor. It always takes a bit of an adjustment getting used to a new narrator in a series, such as the case with this book. The new narrators are Heather Lind (she read Blood Red Road) and Ed Westwick (of Gossip Girl and City of Fallen Angels). I’m familiar with both narrators so it wasn’t too hard to get used to them. They took turns with the narration, with Lind reading more of the Tessa oriented chapters, and Westwick taking on the Will centered chapters. Both of them did a great job with the accents, of which there are many types in the book. Lind has a pleasant voice to listen to and matched very well with my impression of Tessa. She even sings the parts of Agatha the heartbroken singing cook. Westwick gives a dramatic performance, and captures the emotional highs and lows of Will and the other characters admirably. At first I thought Westwick was better suited for the more contemporary Mortal Instrument series, but I warmed to him as the book progressed. Whereas Clockwork Angel took me over two weeks to listen to, I knocked off this book in half the time – and I think the narration made some of the difference.With Clockwork Prince, I’m fully on board with the series and anxious to read Clockwork Princess in March of next year. If you like a charming historical setting, steampunk, fantasy, and of course love triangles then this series is for you. I enjoyed the audiobook experience, but listen to a sample before taking the plunge to see if it’s your cup of tea.